A few days ago it have spoken again about ETTORE MAJORANA, the Italian scientist who died in 1938. The TG1 and the well-known program "WHO HAS SEEN" have given wide information. The contacted Eugenio Siragusa thus expressed in response to a well-known weekly of the time. The sicilian scientist ETTORE MAJORANA disappeared voluntarily for a mission that only time reserves the right to disclose to the whole of humanity of this unfortunate planet. His dissapearance was scattered in the year 1938. He is more alive than me, you and all those who have believed and still believe he committed suicide. I would have liked to give this wonderful news to his beloved mother who died with the certainty in the heart that his ETTORE was alive, but I arrived two months late. I spoke of how i was acquainted with one of his brothers, but the insensitivity he shew me, forced me not to futrher insist. Now to defend his universal genius and the great minds that are with him in an inaccessible and secret place of the earth, in full and harmonious collaboration with extraterrestrial scientists, i feel the need and the duty to communicate this to relatives and friends who believed that he was a vile defeatist of divine values of life, (IN THIS CASE "NO") that he had an encounter in the Casertanomountains with a person that he sent himself, in the year 1956 - 57. He and the other ones, wrapped in the same mistery halo, by accepting the invitation of super- intelligent creatures , which came to earth from other planets, animated by high spiritual and moral values and strive of pure cosmic science, are in full work , sustained and helped by their great love for their brothers in danger, and with a great and safe rea- lization of true Justice, true Peace and true Brotherhood among men under the banner of the greatest Love of all Loves. It has been sixty years playing under a flag that men and women of this world don't know yet, but who will know why this Great event thjat will knock on the doors of this time and of this generation. Many assme him death, but one day he will tell you that what you have believed for him haven't exist. He is alive in the conscience of those who have believed worthy to entrust a giant task valid to his spiritual stature and his universal genius. P.S. If you want to know more, please let me know about it personally and with due caution that the case requires. ..RIPPING THE ATOM, MAN PUTS ON A PLAN TO CREATE DESTRUCTIVE ENERGY,DEATH AND DESTRUCTION ... FUSION OF THE ATOM AS THE SUN CLEAN AND FREE ENERGY .... ETTORE MAJORANA .... KNEW THE CAUSES AND EFFECTS OF THIS ENERGY AND WHAT IT WOULD HAVE EXHALED,AND, ABOVE ALL, THE FACT THAT HOW MAN WOULD HAVE PLACED WITH IT .... FOR THIS HE WAS TAKEN SAFE AND READY TO CARRY OUT HIS PROGRAM WHICH WAS A SCIENTIST AND CONSCIENCE OF THE III MILLENNIUM… ..
" in the hydrogen atom resides the primary code and the cause of the Creative Light . The dynamism that educates and structure the hydrogen atom is the Spirit of visible cosmos that determines the space-time. The hydrogen atom is the omnipresent power of the continuous becoming of things, and it is the cause of the Creative Spirit that resides in it with Power and Gory…"
We have talked about more and more times of Men-Gods, descendants of the races of the past, instructors of humanity which are hidden at this time on Earth. Thanks to the revelations of these special envoys, instructors in the world, we know that the people of El Dorado are composed, in the majority, of terrestrial people carefully chosen, living in fraternal communion with inhabitants of other planets making part of the Confederation. The coordination of all social structures are in the hands of scientists, among them is the eminent physicist Ettore Majorana and his other colleagues, mysteriously disappeared from the surface of the Earth. With them operate other scientists of the Confederation, which will be entrusted with the task, in the future, to manage and sustain the scientific evolution of the planet . "It is becoming more and more irreversible the negative progress of your absurd science production." Our Superior Science springs from mathematical exact formulae with absolutely positive development directions . The negative direction for ouir science and our conscience must never exist, even if we know that this it is developable. 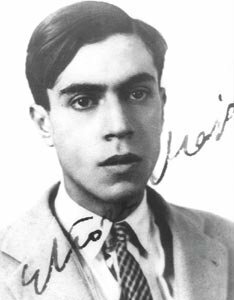 On your Planet one of your many scientists good and conscious, named Ettore Majorana, batched until the complete renunciation of his own pride as a scientist, to prevent his friend and colleague named Enrico Fermi, to develop the wrong direction and disastrous nuclear physics. He is with us today as they are with us many other scientists mysteriously vanished, for having accepted our Offer to be educated on the plans of Cosmic Science to be, a day, not far from there, the wise, righteous and aware Leaders of those who are already forerunners of the Kingdom of God on Earth". This is my witness to leave permanently clear the case.